Situated in the heart of the city centre on the Lange Reihe, this elegant café and bar offers a supreme choice of cocktails, long drinks and wine. The Baccino’s excellent aperitif comes with three selected snacks on the house. Wine lovers can try four different wines of their choice as part of a wine tasting session, and drinks are served with delicious varieties of bruschetta. This fine venue can also be rented for private parties – for all those who want to celebrate that very special occasion. This rock 'n' roll hotel is a temporary home to bands playing the many live music stages of St. Pauli. It has its roots in Rock, Punk, Soul and Rockabilly music. The bar is also a reception and barkeepers will help you find your way through St. Pauli. The Bar of the hotel “Empire Riverside” is very exclusive. From the 20th floor you have a great view across the harbour by night! Silbersack is a cult-bar in St Pauli opened in 1950 which draws a wide audience ranging from banker to homeless guy. German Schlager and Hamburg shanties blare from the jukebox and make the audience dance until the early morning. Krypta im Golem / ibid. Hamburgs bohemian shelter due to a varied avantgarde cultural program including films, readings, concerts and parties; very good cocktails and many regulars from the local art and music scene. Bar at Kleines Phi / ebd. The specialty of this bar is the focus on the latin-american drinks based on Tequila, Mezcal or Rum. Through a small door in vintage charme one can get to the backyard which promises unforgettable summer nights. Behind black curtains in this modest bar extravagant cocktails as "Stormflood" or "Will you still love me tomorrow" are the state of the art. 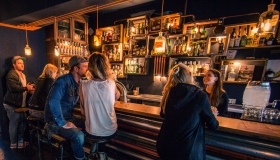 The bartenders here rely on selected fine spirits and local liquors like "Lütt`n Hamborger", „Altländer Williams-Christ“ or „Hamburger Edelbitter“. Besides fruit liqueurs you can also choose from a variety of craft beers on tap. Blog Post "A pouring Tale"
St. Pauli’s Paul-Roosen-Straße is turning into the latest bar/restaurant spot with Clockers being the latest addition. Cocktails and a DJ-set are the best start for a night out at St. Pauli. Upstairs is a secret room for private and exclusive events. Also check out the neighbourhood! This casual retro-style bar and pub is located in the heart of the Schanzenviertel and is open from 2 pm daily. As well as featuring an extra-long bar counter and a mini disco area, the Goldfischglas also provides the opportunity to enjoy a casual match of table football. Every first Monday of the month, the Goldfischglas hosts a live session with two local bands from Hamburg. Craftbeer-Bar "Galopper des Jahres" im 73/ ebd. Right in the centre of bar hot spot Schulterblatt "73" focuses on craft beer and a varied cultural program. Next to it is the famous occupied theatre “Rote Flora” and in the basement their Club “Kleiner Donner” hosts parties and concerts. This lion’s den is small and dark, yet very elegant. Discerning people who appreciate a perfect drink go to this bar. 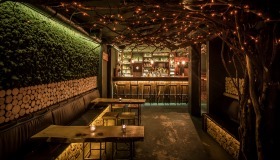 The landlord values a sophisticated and private ambience. Only risk: you will want to spend every evening facing the golden lion, which poses majestically behind the bar. The Barkeeper just won the Mixology award 2014. The former Hasenschaukel pub has turned into a real mad hatter, where you can enjoy extravagant drinks such as the Cynar Tonic, which is mixed from Italian bitters with an artichoke base. The Mad Hatter is open Monday to Saturday from 6 pm and also features live DJs to add a pinch of spice to this distinguished drinking experience. But beware: only those who ring the doorbell will get in! The brandnew Chug Club has just openend under the lead of barwoman Betty. In dim light, sitting on stools covered with dark green Velvet, here one mostly drinks the trademark of the bar, the so called "Chug" - a high class and creative cocktail in small sizes, somewhere between shot and shortdrink. Always a good idea: the Agave-Liquor. A cozy little bar in the middle of the Reeperbahn where people enjoy good and reasonably priced cocktails in a relaxed atmosphere. The whole street Hamburger Berg is a bar strip popular for warming up or last Drinks during the week hours. Very popular and friendly bar in the district Sternschanze. During the week you drink your cocktail to nice music and friendly prices. On weekends the bar is a club with great music to dance. Don't miss the Caipirinha Happy-Hour. The beachclub is located right on the River Elbe, it has a great view of the Elbe and the port. As soon as the first rays of sun appear, the kiosk is the first port of call for hipsters and staider Hamburg residents alike.